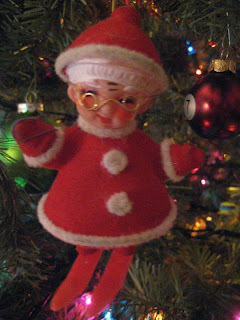 I have always loved Christmas especially the decorating of the tree and and more importantly the individual ornaments. I love that ornaments have this ability to make their own little worlds. 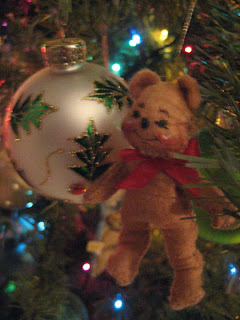 I took a few photos of some of my favorite ornaments, new, old, handmade and yes not handmade too. I love haw Christmas and this time of year really seems to bring out the best in all people, weather you celebrate Christmas or not. 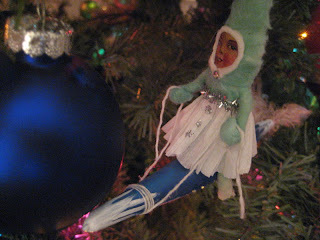 I also think we all can take a note from Christmas ornaments and add some more glitz and glitter to our lives! I hope you enjoy the photos! Rocket girl was made by Vintage by Crystal and I got her at the Martha Stewart craft show last year in NYC. 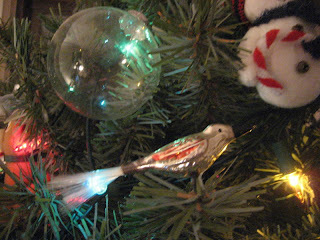 My favorite ornament of all, this was my grandfathers bird that he would clip dead center on the tree every year. 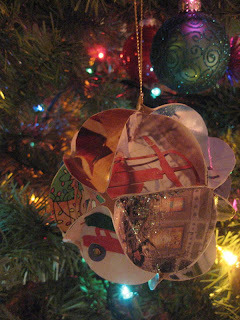 Lastly I made this ornament after Christmas from all the Christmas card I had received... 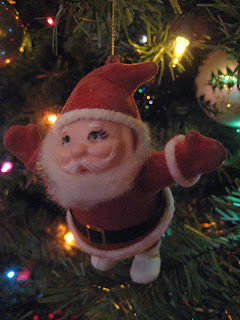 I'll do a how-to after Christmas this year on the blog as well!